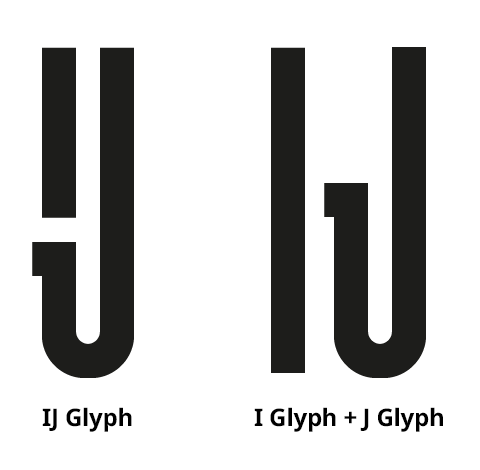 I'm designing a display typeface and have designed, for the Dutch capital IJ digraph, a ligature that combines the "I" and "J" to form what looks like a broken "U". From what I understand, the 'broken U' form is acceptable, but I'm not sure if this is an acceptable, and easily readable, form for regular use. Most real-world examples I have seen in this form have been in signage or logos which is causing my doubt on it's suitability; but my exposure to Dutch is basically non existent. Would a native Dutch speaker be surprised to see this form of ligature in a normal passage of text? Or is it more of a stylistic alternative? I'm also interested in whether this would be more suitable for a display typeface (as this is), or would it be equally suitable in a text face? Note, Implementing the Dutch IJ digraph as a ligature is asking about the technical implementation (through OpenType features); here I'm specifically asking about the suitability of the ligature design itself. My first thought was, "wow, low bridge ahead" – but I had a hunch it was to fit in with the rest of descending characters, and so it does. You even use this on the lowercase f, which makes for a fine visual rhythm in fĳ- words, and it's a very nice change from the usual efs. As for the capital: being a native Dutch speaker, I definitely prefer the left, condensed Ĳ ligature over the separate characters on the right. The letters are too disjoint there for comfort. A point of criticism: I suppose you modeled it after the J, which would be where the high left end of the bowl comes from. In the standalone character, that serves a purpose: to "fill in" what otherwise would be a very large white rectangle on the left. But it's not necessary for the Ĳ! I suggest moving the white space gap a bit lower so the impression of a misprinted U is lessened (not that this is a real danger – I really have to squint to make myself believe it's a U, and the serif on the leg already helps a lot). Although it could be nice to have these Js exactly the same, there is no pressing need, and in Dutch usage a slightly variant Ĳ is certainly no problem. In your own design, it's almost as high as the center of the E, and the J part is overpowering. I aligned it more with the bottom half of the E, somewhere in the middle. Not about the Ĳ, but maybe you can look at that capital Z again. You avoided large white gaps in the other letters (I suppose the F is the proverbial exception), but the Z appears to be wider – visually. You can see a glimpse of that in the Black font version in the word zĳde. It's a minor point; perhaps narrowing it will render the slanted stem too vertical. Not the answer you're looking for? Browse other questions tagged critique typefaces font-design glyphs ligatures or ask your own question. How do I fix a broken font after adding anchors and changing ligature lookup names? What color is suitable for IT company? Is there a formula for the largest readable font size? How do I create a font that automatically uses accents and removes duplicate letters?